At UF Health, our neurosurgeons are leaders in the nation for cerebrovascular and endovascular neurosurgery. Our experienced neurosurgeons provide specialized, state-of-the-art care to patients with neurovascular conditions; care that is both timely and compassionate. UF Health neurosurgeons perform more than 1000 procedures per year, including both endovascular and open cerebrovascular surgery to treat the most complex neurovascular disorders. They are pioneers in advancing the treatment of neurovascular disease through clinical and basic science research, and through developing, testing and refining the latest technologies and devices to improve patient care. In addition, these physicians are dedicated to training and educating the next generation of neurovascular surgeons. Finally, the UF neurovascular team members are leaders in clinical and scientific research in cerebrovascular disease and are investigators of many clinical trials advancing cerebrovascular medicine. When a weakness in the wall of a cerebral artery allows the vessel to swell, an aneurysm develops. The aneurysm may rupture causing death or a stroke, or it may compress surrounding tissue or cranial nerves. Fortunately, many aneurysms now may be diagnosed with CT scans or MRIs before they rupture. Treatment includes open neurosurgery, or craniotomy, to clip the aneurysm. 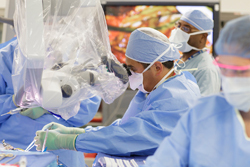 In many cases, patients may be able to have a minimally invasive endovascular treatment. One procedure is called “coiling” in which micro-coils are placed inside the aneurysm via a catheter to close off blood flow and thus prevent rupture or stop bleeding, or a stent, such as the Pipeline Embolization Device. A stroke occurs when the blood flow to the brain is disrupted, as the result of either a blockage or a hemorrhage. Stroke is the third leading cause of death in the United States, affecting about 795,000 people every year. A transient ischemic attack (TIA) or mini-stroke is a temporary blockage of a vessel to the brain that may last for as little as 15 minutes. If a stroke has already occurred, the first line of treatment may be thrombolysis, the use of clot-busting medications. This is only effective if administered within the first few hours after the stroke has occurred, and only in certain types of stroke. UF Health neurosurgeons are part of a select group of physicians in the country with expertise in sophisticated endovascular procedures including the retrieval of clots or the lysis of clots in blockages causing the stroke. 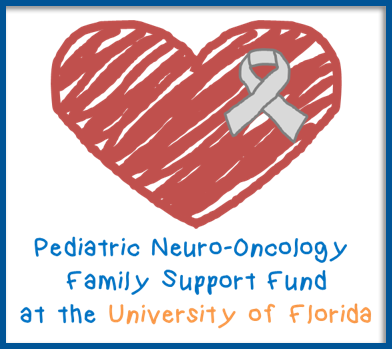 The neurosurgery team at UF Health performs many of the latest state-of-the-art endovascular neurosurgical procedures. These minimally invasive techniques blend neurosurgery with radiology and involve the use of advanced image-guidance technology. The procedures are performed at UF Health Shands Hospital using thin catheters introduced into the vascular system through a vessel in the groin, arm or neck. 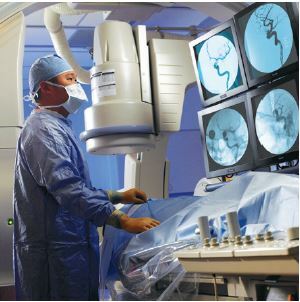 Procedures include diagnostic angiography, balloon angioplasty, stent placement, embolization, and coiling. We pride ourself on providing referring physicians and patients with easy access. Referring physicians should call the department’s main number 352.273.9000 to arrange for a neurovascular consultation. Patients are routinely seen on a next day basis if needed. The department’s website (neurosurgery.ufl.edu) provides information about all aspects of neurosurgery and on neurovascular surgery.